I think they call it "tabletop quality." So, if I'm not a skilled artist, why have I had the audacity to write a painting guide? Simple really. I sort of wanted to show that anyone can do this, and it doesn't just have to involve a base undercoat and a tin of Army Painter Quickshade. (Not that there's anything wrong with dipping miniatures either.) But also, I thought it might be fun to show people how I flounder through this stuff. I'm not so much going to guide you as I'm going to flail around wildly, leaving a broken trail to show where I've been as a warning for anyone else. Oh, and by the way, if people are interested in this sort of thing, I'm toying with the idea of making it a semi-regular feature (not that anything on this blog is even close to regular). It's a little bit different to my normal content. Tangents and conversations about the biscuits I was eating while I painted these miniatures will be kept to a minimum. I have to stress that this is not a guide for anyone even remotely confident with a brush. 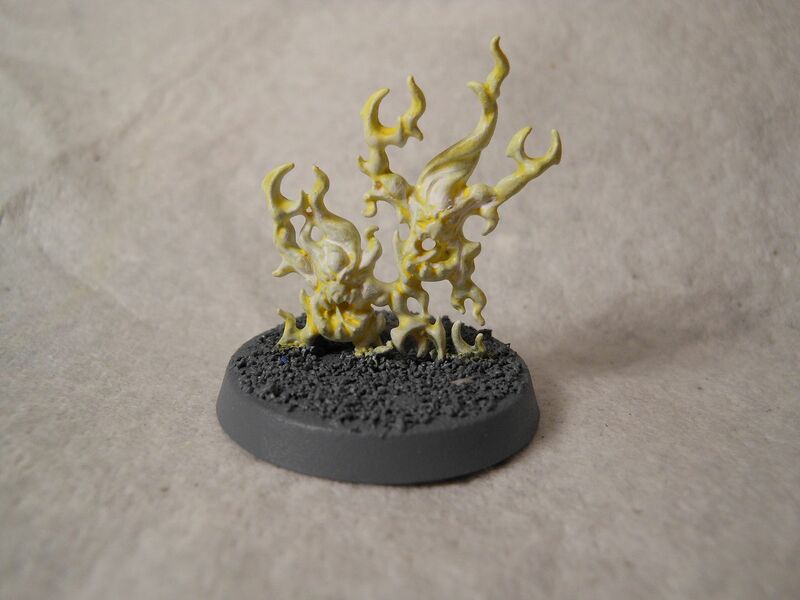 But if you're thinking about giving painting a go, this is how I painted my cute little Brimstone Horrors from Games Workshop's Silver Tower. You're supposed to undercoat Brimstone Horrors white. 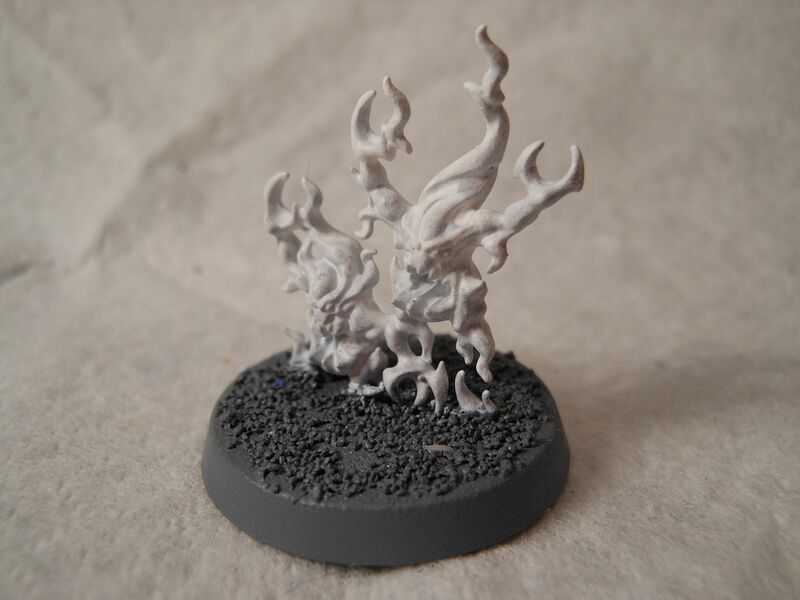 They're little fiery dudes, so you want them to have a white-hot base coat. I didn't have any white base coat, so I sprayed them with Army Painter Uniform Grey. Figured it would make painting the bases easier later on. Of course, after the base coat was dry, I then had to slap on some white. I used two thin coats of Games Workshop's Scar White, applying it with a flat drybush because I didn't have to worry about being careful except around the base, where I tried to keep any splatter to a minimum. Once the white was dry, I watered down some Army Painter Daemonic Yellow (by the way, I pretty much exclusive use Army Painter, I'm not made of money, you know). I slapped the yellow over the white base coat. But if you are a bit more careful than me, you can get some really good results. 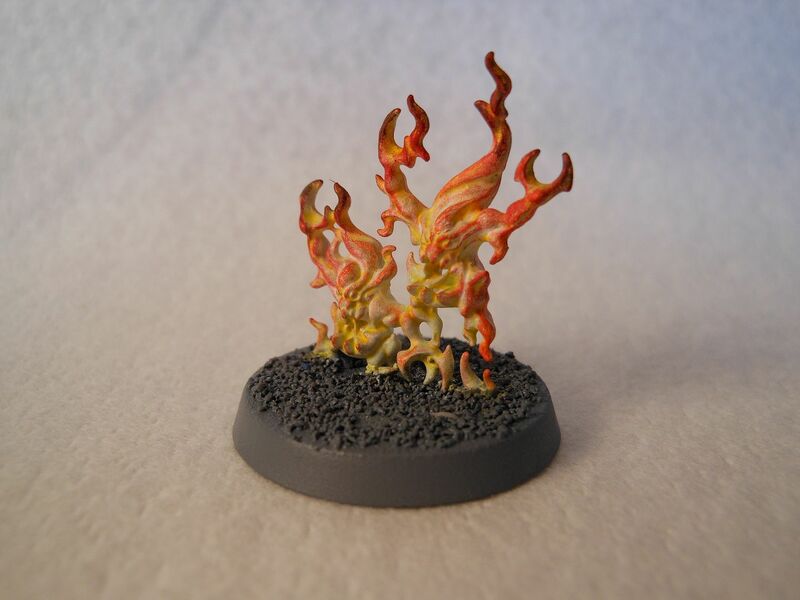 For the Brimstone Horrors, it was a case of drybrushing with Army Painter's Lava Orange, Dragon Red, and Chaotic Red. For each colour, I applied a little less paint, and moved further towards the edge of the flames, to make it look like the flames were hotter in the centre. 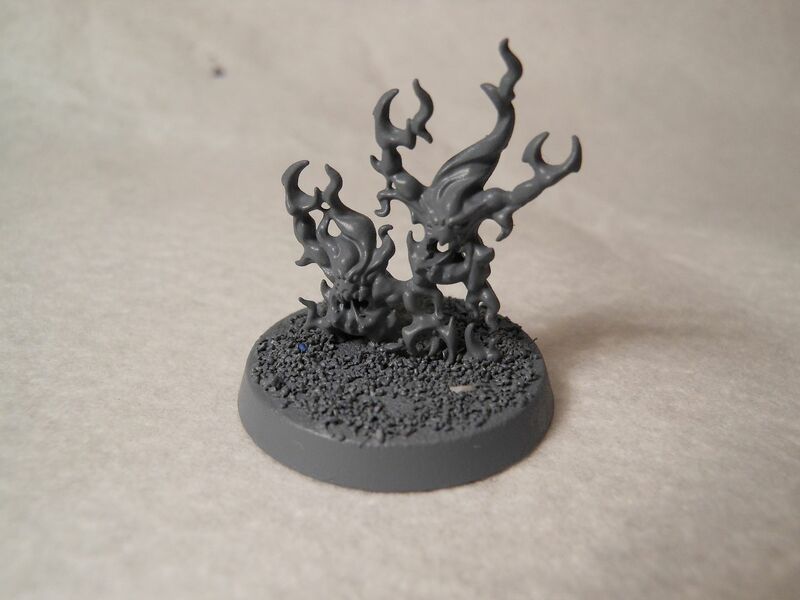 Finally, I drybrushed the tip of the flames with Games Workshop's Chaos Black, because I saw it in a White Dwarf magazine and it looked awesome. At this stage, it's just a matter of the fine details. I picked out the eyes with Chaos Black using an insane detail brush, then I touched up the Uniform Grey on the base, and gave the base a wash of Army Painter Strong Tone. When the base was dry, I drybrushed with Army Painter Ash Grey, and then Games Workshop Scar White. The finishing touch was edging the base with Chaos Black. I always do this, just because I like the look of it. 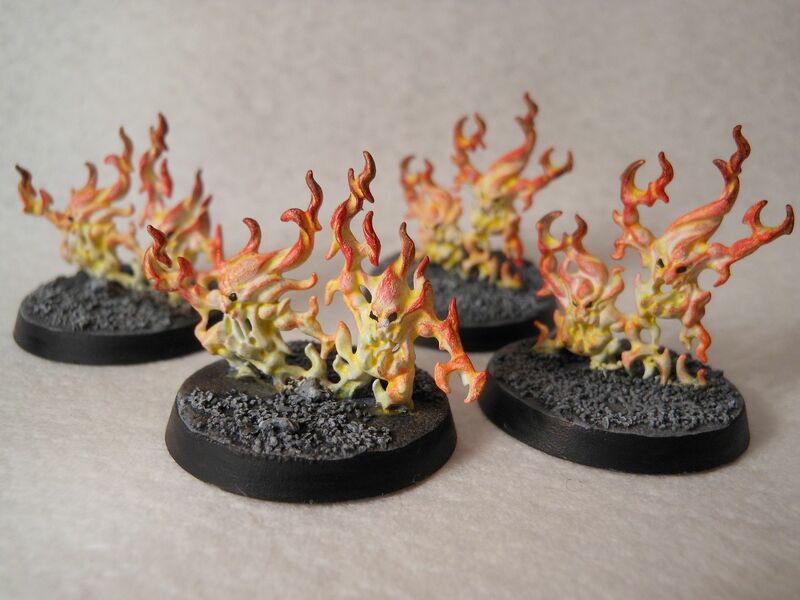 I considered adding some static grass to the bases, but I think I'll probably leave them as-is, assuming the Brimstones have burned away all the vegetation in the area. And that's it. These are ready for a protective coat of artist's matte varnish, and if you add up the amount of time I had a brush in my hand, it was about 30 minutes to get all four finished. For all my self-deprecating comments, I'm pleased with the result... well, until I look at other people's efforts on the Internet... And when it comes to painting, being pleased with what you've done is the only thing that matters. The Army Painter Mega Paint Set, is available at any good hobby store and is a great way to get a lot of the paints you need in one go. I would love to see more content like this on your site! I don't have much access to miniatures and models where I live, so having the chance to at least see the process of how to paint these figures is really interesting to me. Thanks for the feedback. I appreciate knowing if people want to see more of certain things. I will definitely post some more articles on assembling and painting miniatures in the near future.